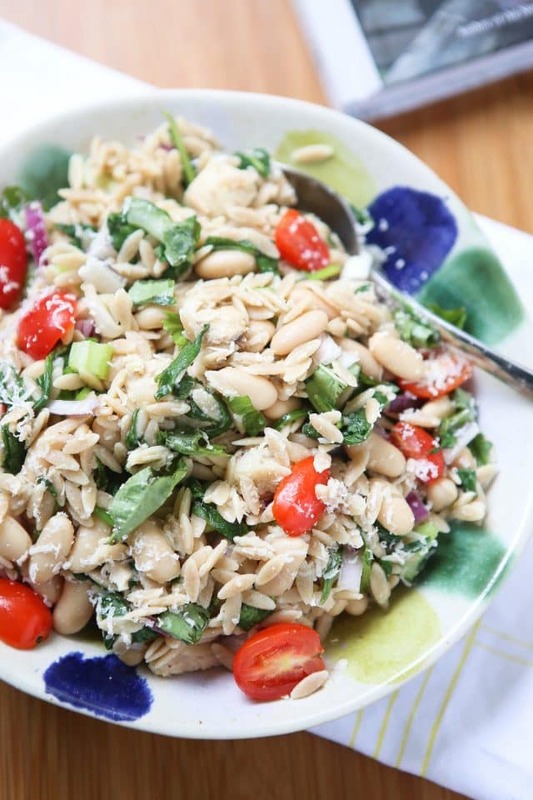 This Tuna and Orzo Salad with Parmesan and Basil is a perfect dish for warm weather entertaining or an everyday lunch. It’s filled with protein and fresh flavors. Before I talk about today’s recipe, I first want to thank every single one of you who took the time to fill out my recent Reader Survey. I read through every response and appreciate all of your comments and feedback. It was a treat to learn more about those of you who come here for my recipes!! Thank you thank you. If you have yet to fill one out and would like to, you can do that right here. Today’s recipe is a special one. It is from my friend Andie’s new cookbook, Eating in the Middle: A Mostly Wholesome Cookbook and I’m so excited to share it with you. Her blog is a source of healthy recipes as well as wisdom and encouragement to live a balanced life after losing weight. Andie lost 130 lbs years ago and has shared her journey in her touching memoir It Was Me All Along (my review of it here). If you’ve ever struggled with weight, her very personal story about her struggles and relationship with food is one that many can and will relate to. Ok, on to the recipe! If you don’t know, now you know – I love tuna. A tuna sandwich or salad is one of my favorite options for lunch, especially when I’m looking for something quick and with a lot of protein. 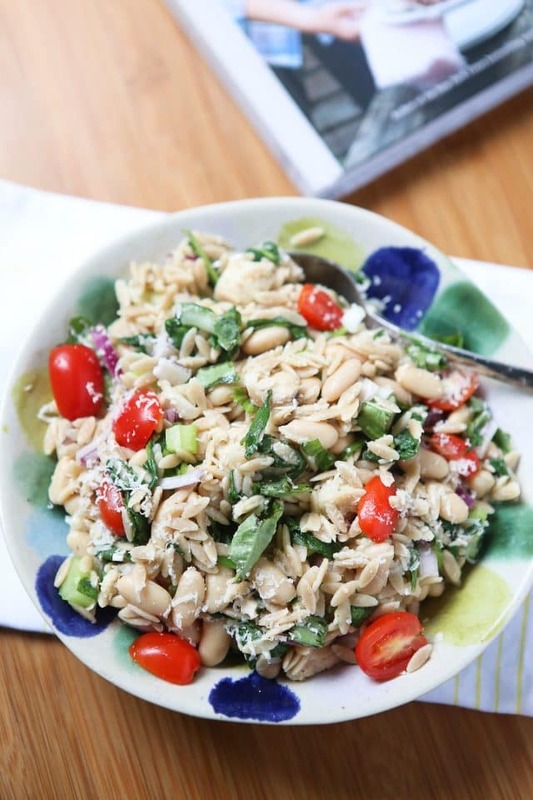 Andie’s recipe for Tuna and Orzo Salad with Parmesan and Basil in her book immediately caught my eye and I knew that it would be great to have for lunch or dinner, especially if you are entertaining friends in the upcoming summer months (the recipe makes a lot!). I personally enjoyed it for lunch over several days, it was a great portable lunch I could take with me on days I had class. I made the recipe exactly as is except I used whole wheat orzo because that’s what I always have in my pantry. 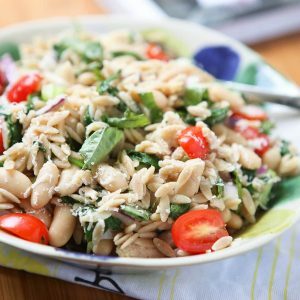 Whole wheat orzo is filled with extra protein and fiber so it’s a no-brainer for me to use it when I can – no one in my family has ever complained about whole wheat pasta, it’s just the norm around here. The simple honey and lemon vinaigrette that dressed this salad was amazing and I will surely be making this one again – as I mentioned before, this orzo salad would be perfect for summer get togethers. Especially with fresh basil from your herb garden! Cook the orzo according to the package directions. Drain and let cool slightly. In a small bowl, whisk together the lemon juice, garlic, honey, salt, pepper and oil. In a large bowl, combine the warm orzo with the spinach and stir to allow the spinach to wilt slightly. Add the beans, tuna, red onion, celery, tomatoes, and basil. Pour the vinaigrette over the orzo mixture and toss to coat. Stir in the Parmesan cheese. Serve the salad warm, at room temperature or even chilled. The salad will keep in an airtight container in the refrigerator for 5 days. 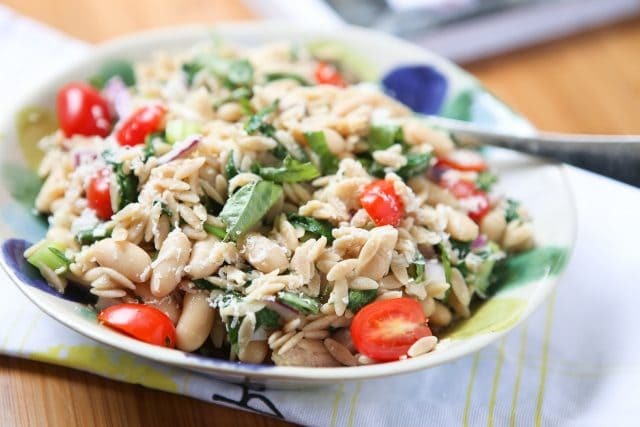 I love using whole wheat orzo in pasta salads, it’s packed with protein and fiber. Andie, this looks amazing. 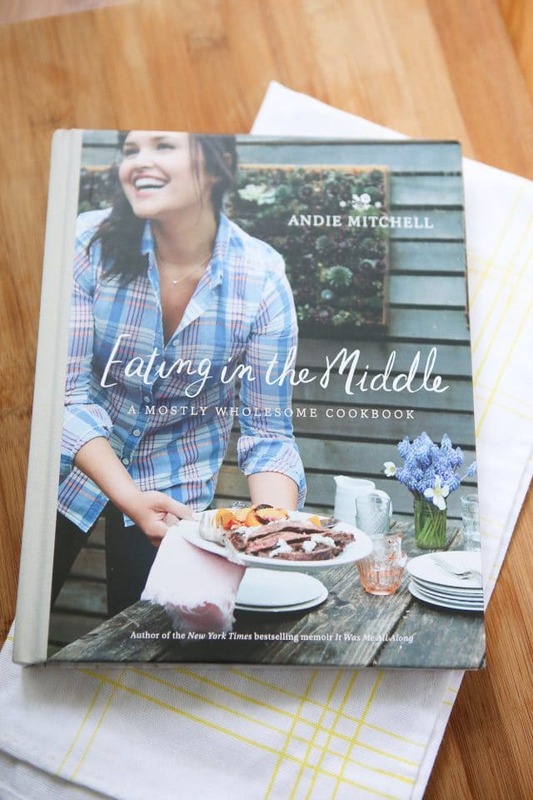 And I love Andie’s new book – full of so many healthy, yummy recipes!